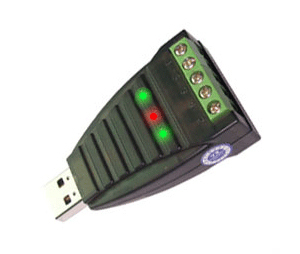 As a converter made in particular for light industrial and commercial projects and applications requiring a stronger than standard converter this USB to RS485 / RS422 converter is made of semi-transparent hardened ABS plastic, so it won't break easily. The wire terminals are reinforced and slightly larger than standard to make it stronger and the operating temperature is from -40°C to +85°C. As most of our other converters this converter is electrically protected against static electricity, high voltage spikes and other high voltage spikes which potentially may damage your equipment and cause data loss or communications errors. The electrostatic protection is achieved by four high-speed TVS's (Transient Voltage Suppressors), one for each data line. 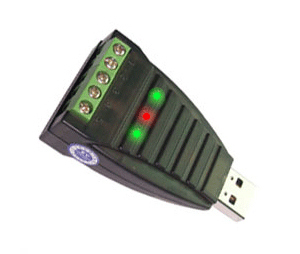 Power for the converter is provided by the USB port so no external power supply is needed. The internal circuitry is designed around the high performance FT232RL serial processor chip from FTDI. A very solid design which is compatible with all versions of Windows, Linux and Mac. Once the drivers are installed a virtual COM port will show up in Device Manager, this port can be used as if it was a regular built-in COM port. The drivers software will allow you to adjust several port settings such as COM port number, baud rate, data bits and latencies. Automatic Send Control is enabled so no external hand shake control or flow control is required. This USB to RS485 / RS422 converter will automatically sense if RS485 or RS422 is connected to the serial interface. Simply connect your wires and its ready to use; no need to fiddle with jumpers or software settings. It can be used with up to 32 nodes in point-to-multipoint networks or as a simple point-to-point setup.